I am excited! And ready for something totally new to me! 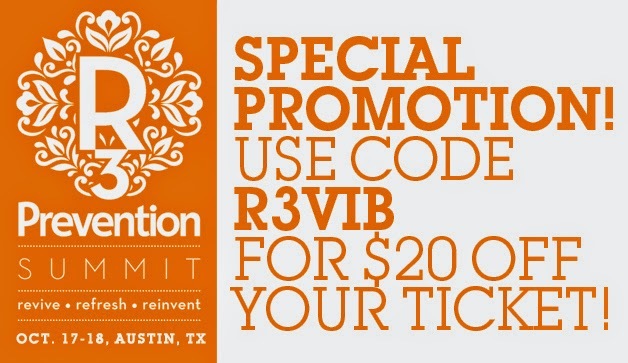 I have been invited by Prevention Magazine to be a VIB -- Very Important Blogger -- at their upcoming R3 Summit (refresh, revive, reinvent) October 17-18 at the Long Center. Now in its second year, R3 features health/wellness, fitness, culinary, and beauty experts and sponsors and puts you in the driver's seat to discover new ways to optimize your health. Some of the presenters include actresses Andie MacDowell and Annabelle Gurwitch, CBS Medical Correspondent Dr. Holly Phillips, barre3 founder Sadie Lincoln, and exercise guru Chris Freytag (I've done her videos!). There will also be skin and hair consultations, healthy cooking demos, chakra and reiki sessions, and fitness demos. Check out their website or Facebook page for all the details on the schedule and sponsors. Tickets to this national event are only $95, but as a VIB, I am pleased to offer my readers a discount code good for $20 off! Registration can be done here through their website. Prevention hosted a dinner at Eden East this past week to kick off the Summit's festivities. 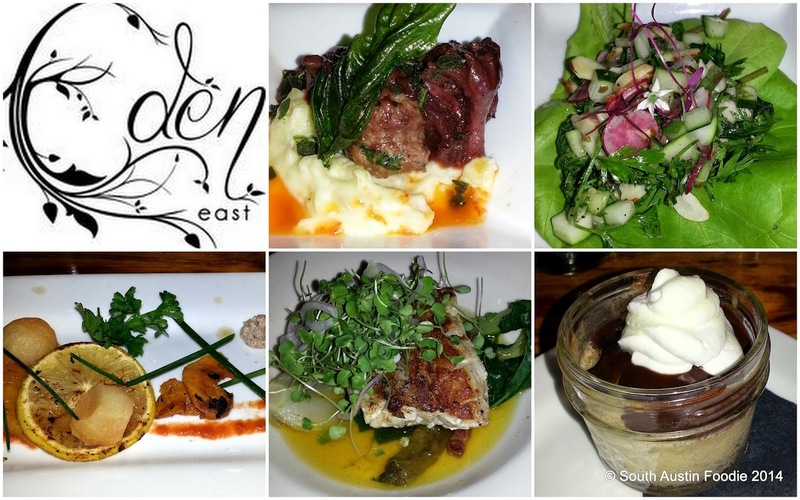 Located at Springdale Farm in East Austin, it's a beautiful setting for an outdoor dinner. Executive Chef Sonya Cote is known for her use of local and seasonal foods, and they do their prep and cooking in a large trailer. With lights in the oak trees and refined picnic tables, it's a gorgeous setting with the farm as the backdrop. We were treated to a five-course meal complete with wine pairings. And speaking of pairs/pears, my favorite course was the delicate pear spoon cake served in a mason jar of course! Thanks to Prevention Magazine for inviting me to be a VIB! In full disclosure, I have been been invited by them to be a VIB, but have not been paid for my blogging opinions or expert fitness services. And if you're coming to R3 from out of town, here are some restaurant suggestions that are within one mile walking of the Long Center, which is conveniently located just south of downtown Austin. Along Barton Springs Road (the south side of the Long Center) El Alma (interior Mexican food), Terry Blacks BBQ (I haven't been yet, but it's supposed to be good, as they have a good pedigree), Sandy's Frozen Custard (not the healthiest, but the custard is delicious! ); going further west past Lamar Blvd is a strip of iconic Austin places, but the food is not what I'd call outstanding at any. A it further down and to the north is Casa de Luz, one of the few macrobiotic places in town. Along South Congress Avenue: Doc's Motorworks (bar food), Perla's (seafood), Hopdoddy (burgers galore), Homeslice (pizza), Enoteca (casual Italian). There are a few places just on the east side of South First Street across from the Long Center, but I don't know that I can give them a full recommendation.